Heya!! Happy Friday to everyone and welcome to another post in the Home Inspiration Style Board Series! 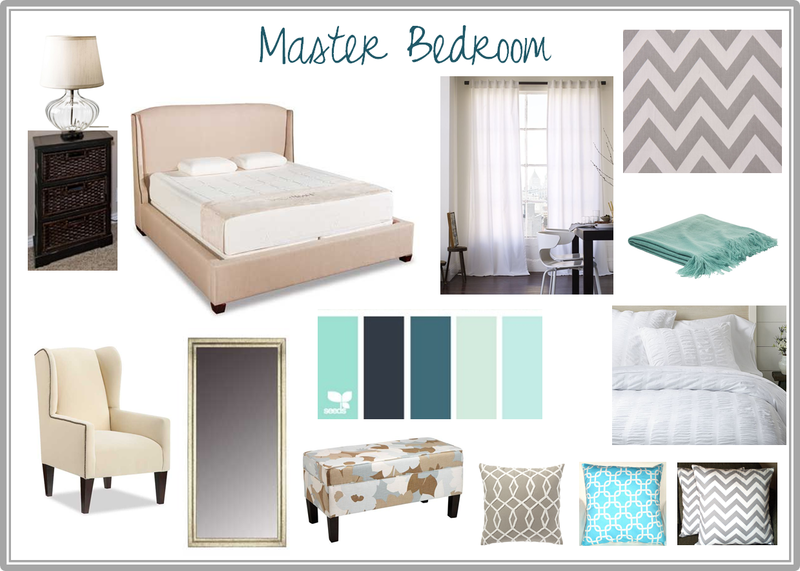 Last week we talked about the design for my future office (which I’m still loving, but have thought of more ideas) and today the focus is all about the master bedroom. While picking out items to match up to my descriptions, I kept seeing images of luxury hotel bedrooms pop into my head. Rooms with thick, plush, white bedding, luxury feather pillows and soft sheets paired with cozy sitting areas, proper lighting and a lush breezy patio area. It’s like the ultimate retreat! But, I also want to add my own spin with a few pops of color and patterns. It’s what makes the world go round! I’m particularly enjoying the combination of the wingback furniture with the contemporary patterns and the contrast of the aqua and gray. It’s becoming quite the serious infatuation. I’ve also discovered something substantial about myself… I have a huge obsession with bedding! I mean, I could probably change the comforter/ duvet set daily. And that can get expensive… So I’m going with the most recent crush, which is white bedding. And white bedding is flexible. It’s a color with many friends. Plus, it looks soooooo pretty! I can’t be alone in this, right? Take a look at these seriously gorgeous bedrooms. Aren’t these images stunning and oh so inspiring? I just want to soak up every single detail and add it to my memory bank! I simply can’t wait to design this room on a budget. Wicker Nightstands- Hobby Lobby, can’t find link. Well, what do you think of white bedding? Are you as completely obsessed as me? Next up, we’re going to focus on the master bathroom, followed by the master patio area. It’ll be lots of fun! And inspiring. We can’t forget inspiring! I’m sorry, but I’m not sure what color/ type of paint are used in those images. I’ve only used them as inspiration images. Sorry that’s not more helpful.